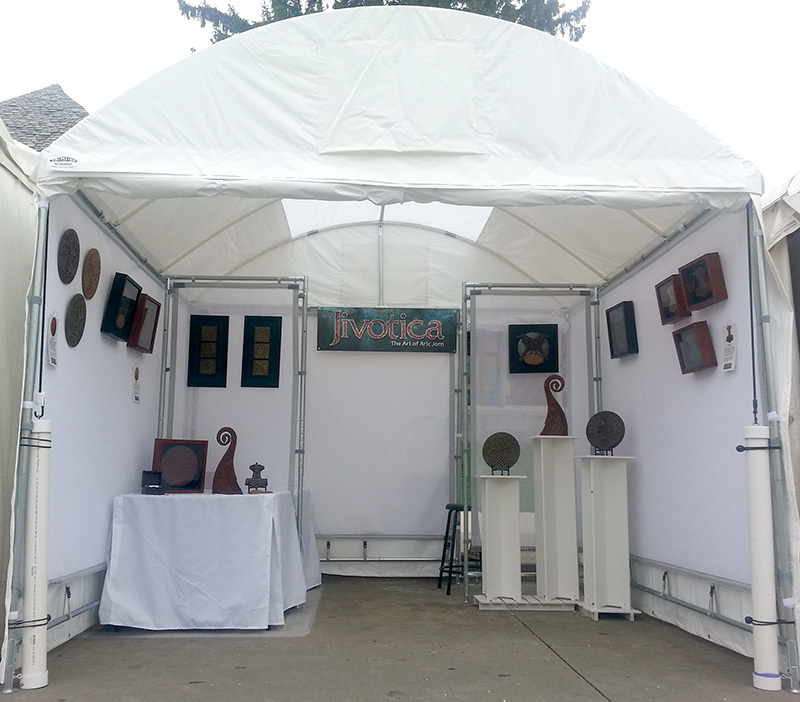 I began my Spring show season this past weekend with the Great Lakes Art Fair in Novi, Michigan. It being my first indoor show, I wasn’t entirely certain what to expect – but, Michigan weather being what it is, I ended up being quite thankful to have a roof over my head. Even so, I managed to get thoroughly soaked in freezing rain during “load out” when a misbehaving dolly with four bins of packing supplies and tent parts decided to tip and I was left scrambling to get everything back onto the dolly while I still had feeling in my fingers. Mishaps aside, the event proved to be a great way to kick off the season and I was honored when the jury awarded me second place at their “Best of Show” ceremony Saturday night (banner photo is of myself and the event’s director, Jackie McMahon.) Prize money and fancy ribbon aside, the most meaningful thing to me is the knowledge that my work is connecting with patrons and fellow artists – that’s the . May 21-22, 2016, I will be returning to one of my favorite spring shows in Michigan, the East Lansing Art Festival. Live music, good food and a ridiculous amount of high-quality fine art awaits the 70,000+ people who annually attend this event. June 25-26, 2016, I will return to my home away from home (Chicago) and participate in the Fountain Square Art Festival in Evanstan, Illinois. For three decades, Fountain Square Art Festival has won acclaim as one of the most prestigious art festivals in the Midwest. 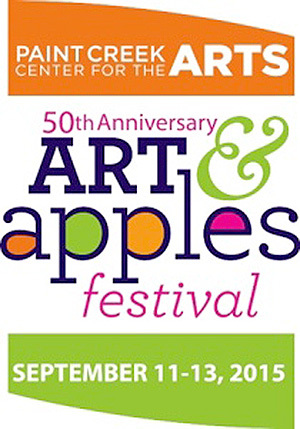 It’s the largest and oldest juried fine arts fair on Chicago’s North Shore and I am delighted to be a part of it. So, if you will be in the area for either of these shows, please stop by, see some great work by artists from all over the country. Lastly, as a reminder, the CROW SHOW will soon be in its final week and will close on April 22. It has been extremely exciting to see my VIKING PROW: COILED SERPENT come to fruition after kicking around in my head for several years – and what a joy to hear the response from collectors and fair goers who have brought it into their homes and offices or stopped in to discuss them with me over the summer art show season. For those who may not know about this piece, it is a tribute to the mighty sea kings of ancient Scandinavia (the Vikings) whose reach extended from Constantinople to North America and from the Arctic Circle to the Mediterranean Sea between the 8th and 11th centuries. It is modeled after one of the most famous archeological finds in Scandinavian history – the Oseberg ship. The piece seeks to capture a sense of the majesty, mystery and artistic flair of ancient Scandinavian culture. 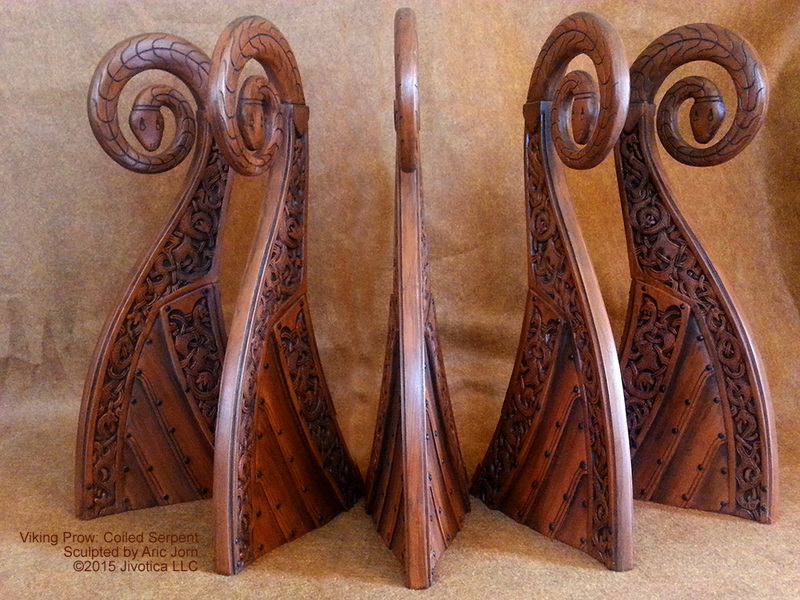 My VIKING PROW: COILED SERPENT weighs about 3 pounds and stands roughly 16 inches tall. It is strictly limited to 95 signed/numbered castings and a handful of artist proofs. Each piece is hand painted, weathered and sealed (so no two are exactly alike). It comes with a signed COA/story card as well. Many thanks to all those who have commented on – or purchased – one of these Prows. Your support and patronage is what drives me forward as an artist and allows me to make a living doing so. My first show of the season will be the 34th Annual Art Birmingham. Originally known as the Birmingham Fine Art Festival, it takes place in the streets surrounding Shain Park, in downtown Birmingham, Michigan. 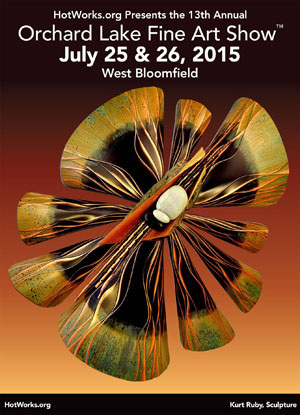 This highly respected event will showcase 160 juried artists. You will find me in BOOTH #90. My third show for Spring is Art on the Grand, a juried fine arts show located downtown in the charming, historic city of Farmington, MI. Now in its sixth year, Art on the Grand features 100 fine artists from around the country. **You can find me at the North end of the fair around Grand River and Warner street in BOOTH #60. I’ll be participating in many other events throughout the year and I’ll post summer/fall shows as the various juries make their announcements. Until then, I hope you will catch up with me at one of these fine spring shows. That brings me to the second announcement. I am pleased to share with you my latest piece, The Prow: Coiled Serpent. Inspired by the Viking long ships, The Prow seeks to capture the grandeur, might and mystique of the Scandinavian sea kings who carved for themselves a permanent place in history and our collective imaginations as they raided the coasts of Europe and beyond from the 8th through the 11th centuries. The Prow represents the next step in my journey as I continue the exploration of my Scandinavian heritage through art that began with my 2014 sculptures of Mjolnir (Thor’s hammer), Yggdrasil (the world tree) and Hugin & Munin (Odin’s ravens). Standing at 16.5 inches tall and hand cast in the same durable resin I use for all my sculptures, The Prow: Coiled Serpent is the first in what will be a short series of variations. This piece (and each variation in the series) is limited to 95 signed and numbered pieces. Sculpted in the round with a nice weight and solid feel, it is designed to make a statement on table, desk or shelf. Advanced orders will be accepted from followers of this blog starting February 1, and will be available to the general public in mid-February. p.s. As always, you can see other work that is currently available on my Etsy store.